A special edition of the Ann Arbor Daily News on February 10, 1929, honored the opening of this proud symbol of the prosperous city of the 1920s. Most of the eighty-five original stockholders were residents of Washtenaw County. When the building was occupied, sixteen floodlights of 1000 watts each illuminated the tower, making it a focal point of the city, day and night, and the subject of a widely circulated picture postcard. Ann Arbor's First National Bank was the first bank chartered in Michigan under the National Bank Act of 1863. The bank's first elegant building in 1867 became Goodyear's Department Store. Later the bank occupied the Glazier building. When the bank moved to the first floor of this building in 1929, the safety of its vaults and the security of its system were advertised far and wide. The crash came in October of that year, and in 1933 all four of Ann Arbor's banks closed during the great banking crisis. The State Savings Bank was solvent and reopened immediately. 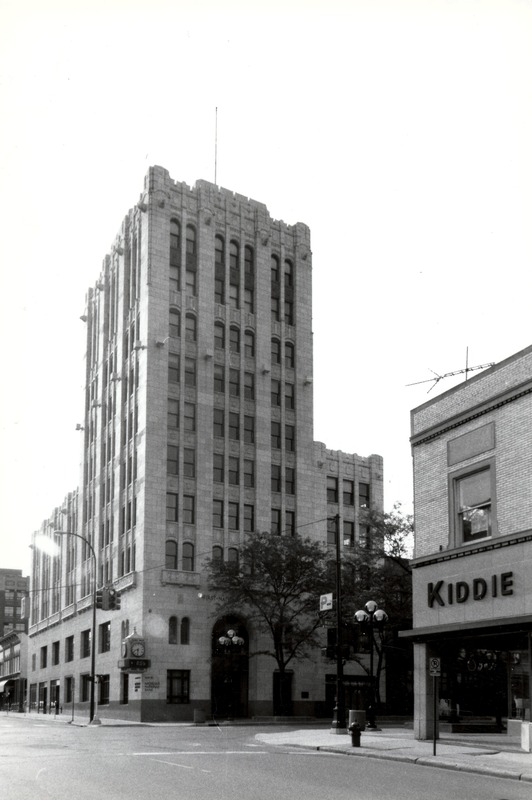 The other three, the Ann Arbor Savings Bank, the First National Bank, and the Farmers and Mechanics Bank had sufficient assets to form one strong bank, namely the Ann Arbor Bank located at Main and Huron. When it opened, the bank's customer lobby occupied the corner. One entered through "an arched entrance with elaborately grilled glass?? ?_ through a marble vestibule, protected by massive iron grilles of Romanesque design, into the banking room two full stories in height." The lobby entrance for the remaining offices was also sumptuously appointed, "finished with black terrazzo floor, black and gold marble base and trim, Italian travertine walls, bronze doorways and richly decorated coffered ceiling." (National Register nomination, 1982). Architect Paul Kasurin (of the firm Fry and Kasurin of Ann Arbor, designers of the building) described the exterior in 1929. "The richness of the terra cotta is accentuated by the polychrome ornament about the main entrance, in the spandrels between the windows of the third and fourth floors and again in the upper part of the building." The broad vertical bands of terra cotta and the banks of narrow windows separated by thin terra cotta mullions give the building strong vertical lines. Gargoyles are mounted immediately below a decorative roof cornice. After 1935 the former banking space was subdivided horizontally creating retail space on the first floor with offices above. The massive bronze door frame and bronze grilles were removed leaving only the huge arch on Main Street. After some years of decline, the first floor facade was restored to its original appearance in 1982 by First Martin Corporation, which purchased the building in 1981. First Martin has subsequently renovated the entire structure. They removed the dropped ceiling in the lobby and revealed and restored the painted coffered ceiling. Photos used to illustrate Historic Buildings, Ann Arbor, Michigan / by Marjorie Reade and Susan Wineberg.